Be the first to share your favorite memory, photo or story of Teofila M. "Tammy". This memorial page is dedicated for family, friends and future generations to celebrate the life of their loved one. 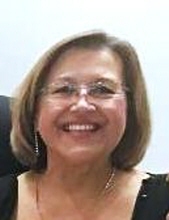 Teofila M "Tammy". Okrzesik, nee Wolkiewicz. Oct. 1, 2018. Age 58. Devoted wife of Joseph M. Okrzesik. Loving mother of Joe(Stefanie) Okrzesik and Vicki(Kyle) Hobbs. Cherished grandmother of Janie and Joey. Beloved daughter of Sofia, nee Szczesna, and the late John Wolkiewicz. Dearest sister of Eva(Keith) Harrah, John(Tahani) Wolkiewicz, and Karen(Ronald) Rutkowski. Teofila is also survived by many nieces, nephews, cousins, and a host of friends. Funeral services Saturday 11:00 A.M. at the Petkus Lemont Funeral Home, 12401 S. Archer Ave.,(at Derby Rd. ), Lemont. Rev. John Kowalczyk, Officiating. Cremation rites to be accorded following Services. Visitation Friday 3:00 to 9:00 P.M.
To send flowers or a remembrance gift to the family of Teofila M. "Tammy" Wolkiewicz Okrzesik, please visit our Tribute Store. "Email Address" would like to share the life celebration of Teofila M. "Tammy" Wolkiewicz Okrzesik. Click on the "link" to go to share a favorite memory or leave a condolence message for the family. memory of Teofila M. "Tammy"